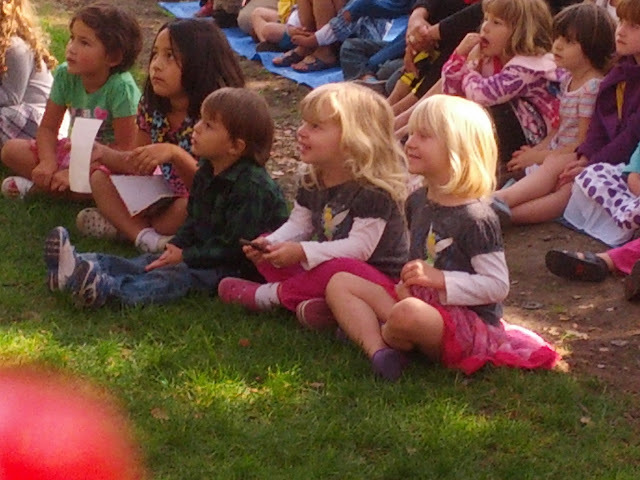 Today Lucy found her twin at a concert at the library outdoor concert. No joke. As Caleb tells it, neither of these two girls noticed the other blonde, tinkerbell shirted, pink legged one next to the other. We were back at this concert because Lucy’s teachers were performing. And for Lucy to have teachers, that’s right, you guessed it, she is in pre-school. This is what she looked like heading out to her first day. Leo is in first grade. He seems to be doing well and actually seems to be finding first grade a little easier than kindergarten. First grade still has a lot of homework and Leo will sometimes go to great lengths to avoid his homework. Here he is making a big ginormous pencil instead of just writing down a few words with that regular sized pencil. Today instead of doing homework Leo is making a book for James Kochalka a comic book author he likes. His book is extremely cute and I would add a “look inside” link here but for some reason I can’t upload any photos tonight. Just as kids seem to have different personalities, Caleb and I are noticing that our snakes have different personalities. Oliver loves to coil around your arm and is actually quite cuddly. Any time you pick up Daisy she will just slither away. Lucy still wishes she had a cat and only has pet snakes. Here she is with our neighbor fluffy. Finally getting to the first part of the Maine trip. This is the part of the story of the beginning of our vacation to Maine. The part where I was a valiant single mom and took my two kids on the redeye alone. Getting from Boston to Maine proved to be difficult for all sorts of health reasons. The first being that Uncle Sammy’s cat was sick. I never knew what a caring soul my brother was, but his kitty was in the hospital and he wanted to make sure he could visit it every day. Auntie Cheryl also needed to get back the results of some bloodwork so it wasn’t until Monday that we all made it to Maine. On these first couple days I got to see some old friends. On Monday my good friend Liz made it out to see us. Liz has a blog as well that you should read. Liz is going back to school to be a fiction writer and you can read her stories on the blog. The kids had a lot of fun playing in the water and Liz and I had fun catching up. Liz tells me that her son kept calling another boy Leo after the trip. Like the girly girl she is, Lucy was excited to show Maddie, Liz’s daughter, a caterpillar. Maddie was nice enough to feign interest. Here is a picture of me and Liz. Then on Tuesday I got to see my friend Sarah. Sarah and I have some kind of psychic connection going. Sarah posted on your wall: happy late birthday. Are you ever coming east? Sarah => you: No way, I am on vacation on Sebago lake right now. How did Sarah, who I have not been in close touch with, know to wish me happy birthday, right about now, (on my birthday), when facebook prompted her? Well maybe it is just how birthdays work on Facebook, but it was uncanny that we were headed to the same vacation spot at the same time. And it was also totally psychic about 3 ½ years ago when I was having second thoughts about a VBAC and I decided to call Sarah, not really knowing why. (If you don’t know what a VBAC is, my gentle readers, you can Google it). But when I called Sarah, she told me she had had a VBAC! Sarah remembers telling me, 6 of one, ½ dozen of the other. But I remember her telling me about someone she knew who had had a tragic experience with a VBAC, so I decided to go C-Section. And I also remember that after my C-Section the doctor told me my uterus was paper thin and surely would have ruptured. So thank you Sarah. Lucy and I are really happy to be alive. Here is Lucy reunited with her lifesaver. But why end on a sappy note? Since Sarah and I went to Barnard we had to spend our time talking about the Anne Marie Slaughter’s article that everyone is talking about. I was glad that Sarah thought this article was as annoying as I did. But even through I also think the viewpoint expressed in this next article is quite Anne Marie like and dumb, it is also quite funny. Check out Penelope Trunk on work-life balance. When I write about my family here in this blog I write about how much fun we have romping outside in the great outdoors. After all, that makes Caleb and I seem like really awesome parents, not letting our kids rot their brains in front of the TV. But when Leo is asked to write about his family he chooses to write about something different.